What You Need to Know About the Latest Tariffs: Is it Time to Panic? The wonderful thing about business is… anything can happen. The horrible thing about business is… anything can happen. For entrepreneurs and brands who sell products on Amazon, the latest round of tariffs in September just brought the US trade war with China to your own front doors. A 10% (maybe more in January) increase to COGS definitely seems frightening, at least at first glance. A little over a month since the news broke, the dust has settled only slightly and looks to kick up again in January. It seems like as good a time as any to assess the situation and consider its ramifications. 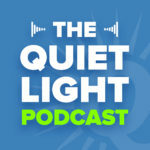 Mark brought James Thomson, a bona fide Buy Box Expert, to the Quiet Light Podcast this week to help us make sense of it all and consider the best next steps for companies now caught in the crossfire. And they’re not wrong, it’s just not that simple. James Thomson, who’s appeared on the podcast before, is an Amazon expert who spent 6 years there running Amazon Services and acting as their first FBA account manager. He’s now a co-founder of The Prosper Show, an annual conference and educational event for large 3rd party sellers, and a partner at Buy Box Experts, a consulting firm offering Amazon account management and branding strategy. What Happened and Where Did These Tariffs Come From? As a Seller, What Are Your Options? Will the Costs be Passed on to the Consumer? What Other Strategies Should 3P Sellers Consider? In some ways it’s the same thing that keeps happening. I live in a former manufacturing town (furniture and textiles) whose economy was tossed up and splattered on the curb when moving production overseas became a matter of survival for all the major employers. While I’m sympathetic to the cause, I can tell you these latest moves don’t have an ice cube’s chance of bringing any lost jobs back to this area and instead threaten many of the jobs we have. Now that we’ve recovered somewhat and reinvented ourselves, this is another blow… I know many Amazon sellers can relate. Back in September, the stakes in the trade war were kicked up a notch when the US announced $200bn in new tariffs on goods coming from China. This move placed a 10% tax on thousands of products and raw materials starting September 24, with the promise/threat to increase the tax to 25% in January. At first glance, the list seems like the largest grocery list ever made (who knew there were that many types of seafood), but as you continue scrolling it starts to get truly scary for online business. Unfortunately, this is just a very partial list, and many items on it are raw materials. Perhaps the best chance we had to seek shelter from the fallout from this trade war in September was to work at Apple. Apparently, they were not affected… Yet. The news doesn’t get better going forward, as tariffs on another $267bn worth of goods have been threatened but haven’t happened yet. According to Business Insider, hundreds of companies and industry reps from all over the US, many in manufacturing, testified in Washington on the dire consequences of the tariffs to their companies or their industry as a whole. Somehow, while the voices of Apple Execs may have been taken into account this round, the voices (45 hours-worth) of small business owners were not. Companies that wholesale products to Amazon through a Vendor Central account. These are the suppliers, known as 1P, who sell in bulk to Amazon by invitation only. Amazon controls the retail price of the products supplied. Companies who sell products directly to Amazon’s customers. These third-party sellers, known as 3P, may private label or resell, and they control the retail pricing of products themselves. James explains that for both types of sellers to stay afloat, profitability now becomes the challenge if your products are on the tariff list. Some of the options you may have to tackle that challenge include negotiating with your manufacturer or supplier to absorb some of the cost. If you’re willing to load up on inventory now, ahead of the January tax increase, that could be a bargaining point. However, this brings up another expense – storage – and Amazon FBA isn’t entirely accommodating in that area. The other options will take time and call for planning now rather than later. For instance, many are hoping to source products made in China from producers in other countries. It’s certainly feasible long-term. But James points out that to find products from other sources that can compete with China on price, you’ll face some major hurdles right now. We have manpower, yes and even some infrastructure left, but not the ability to suddenly set up shop and ramp up production in the next few months. Other countries, James says, will need to get production-ready, but also find or create a marketplace, like Alibaba, where sellers can actually find their producers. This will likely require a centralized effort. Will the Costs be Passed to the Consumers? Mark asks this great question on the podcast this week: Considering that companies and brands will be hit by the extra costs across the board in particular industries, not singled out, won’t everyone be raising prices pretty uniformly? In other words, won’t consumers ultimately pay for this rather than businesses? For the 1P brands with a Vendor Central account, as I mentioned earlier, Amazon sets the retail price and at present doesn’t accept price increases from suppliers. Does this turn of events force Amazon to rethink that strategy? That’s yet to be seen. Right now the company’s got its eye on 1.3 billion customers in India. For 3P sellers, resellers face the same price competition on the platform as ever, where the risk of that rogue nearsighted seller willing to take tiny margins in exchange for high traffic is ever present. Private label sellers have the best chance of anyone it seems, of passing the extra cost on to the consumer. James has seen “2019” editions of products in the making and explains that this strategy of launching a new version of a product can be one way to raise prices effectively for now. At the end of the day, James sees most solutions being thrown around as short-term, and the viable long-term solutions as either finding different products or finding production in other countries. Timing is everything right now. If your suppliers have planned ahead and built up inventory in advance of the tax, you may not see price increases just yet. That could give you some time to plan your next moves and diversify your listings. If you’re considering stocking up on inventory yourself, James had some good info to offer. Apparently, Amazon now determines your FBA capacity based on the sell-through rate of each individual SKU. This means that for some products, they’ll put a cap on your inventory level. Products that move quickly won’t be a problem, but others may. James recommends if you’re considering this in the future, to create an FBA shipment right now and test Amazon’s response to the higher levels. That way you’ll know if stocking up on inventory will be a viable option. If not, using a third party to store inventory, and also possibly switching to Seller Fulfilled Prime, may end up being cheaper now than paying the higher tariffs later. Again, we’re talking short-term solutions, and how this trade war unfolds and how long it rages on is up for grabs – long-term planning is key. When raising prices on Amazon as a 3P seller, you don’t want it to affect your Buy Box percentages. Buy Box percentage is defined as the percentage of page views where the Buy Box appeared on the product detail page for customers to add your product to their cart. Around 80% of Amazon’s sales are made through the Buy Box, so it’s essential as a seller that your products are showing up there. Now you’ll see a table with all your listings on Amazon. You’ll find the “Buy Box Percentage” column in the middle of the screen along with “Page Views” and other metrics. James warns that one thing that keeps you out of the buy box and lowers that percentage is when you raise your item price over the list price. If you change your price, make sure it stays at or below the list price. As a reseller, if you don’t have brand registry ability to change the list price for that product, and a brand hasn’t updated their prices, you’ll run into trouble. James says to start that conversation with brands now. It’s definitely to their advantage to lower the list price on products affected sooner than later, because if they don’t, they’re effectively keeping their products out of the Buy Box for all their resellers. I was introduced to Ray Dalio’s five-step process for growth recently, and it seems particularly relevant right now. For anyone who’s not familiar, Dalio’s book Principles shares the unconventional principles he developed and refined over 40 years while creating the most successful and profitable hedge fund in history. The five-step process he uses to pursue his “audacious” goals looks a bit counter-intuitive at first. For Dalio, the pursuit of goals involves an immediate sharp right turn into problems and failures. Like so many other highly successful people have told us, that’s just part of the process to him. But after that sharp right in his process comes this elegant loop trajectory that takes you right through those problems and back on track towards more audacious goals. Overall the prescription is to assess the problem systematically, diagnose the problem to all of its root causes, and then start developing strategies and designing a plan to overcome the problem. You come out of the loop a better business owner and stronger person. For many US business owners, this particular right turn was a shock. We’re now at the point on Dalio’s trajectory to assess and diagnose, so that next we can design a plan. James points out that some industries, like toys, may see immediate Q4 effects, while for many the biggest effects will be felt down the road, say twelve months from now, if the tariffs stay in place that long. In terms of long-term strategies, he points to South East Asian countries as a good bet for sourcing products in the future, so keep an eye out for developments there. Business continues to be risky. For business owners and CEOs, changes and disruptions come in rapid-fire succession. But entrepreneurs also continue to be the scrappiest and smartest people I know – more resilient and ready than anyone to handle adversity and ultimately find the opportunity in it. With the right response, hopefully on the other side of this challenge waits your next big audacious goal.